In March/April 2016 Who is David Grayson? was on display in the Jones Library Special Collections to celebrate the 100th anniverary of the reveal of David Grayson's true identity. Grayson wrote popular essays about his simple farm life. For a decade no one knew who was behind the pseudonym. This exhibit will take you through the events leading up to March 1916 and the aftermath of the announcement. 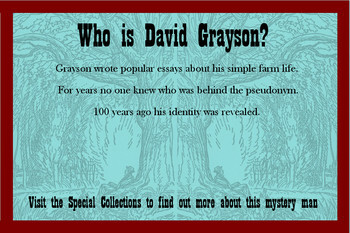 Through fan letters, newspaper articles, photographs, and books you will learn more about David Grayson and the person behind him. Will the real David Grayson please stand up?